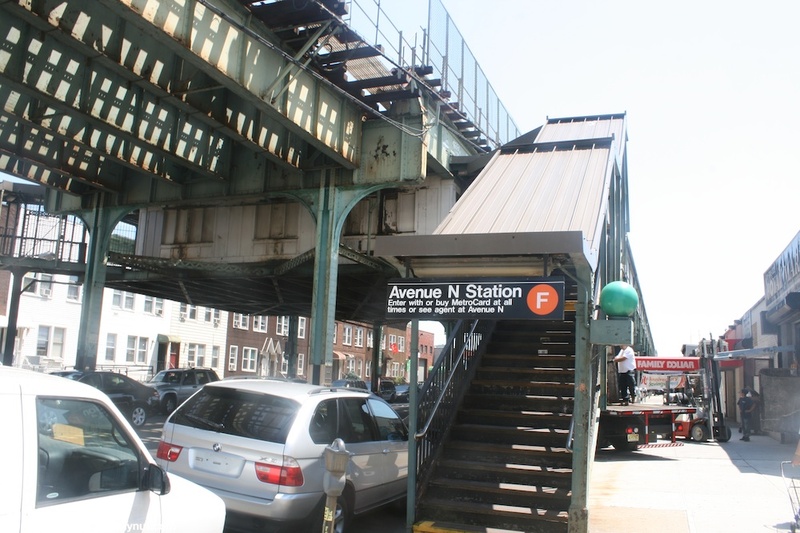 The Avenue N Station has two side platforms on the local tracks of the three tracked line. 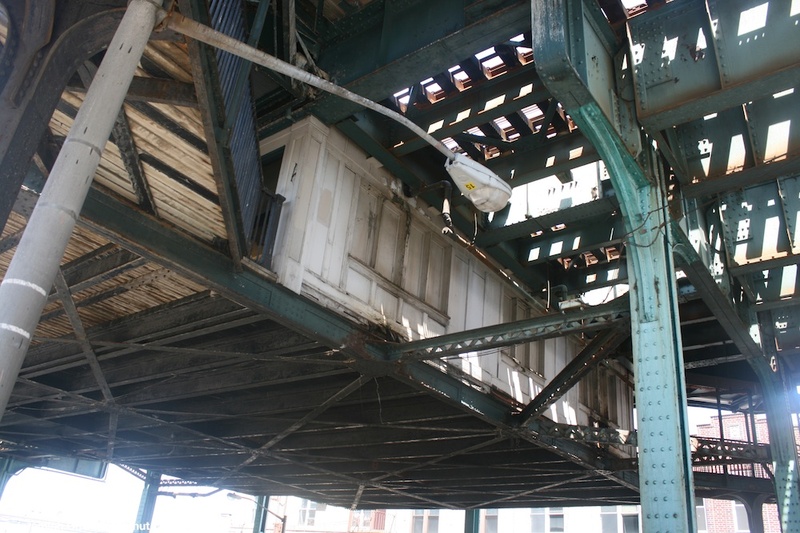 The station's platforms are windscreened, and canopied for their entire lengths except for a small section at their southern ends; here there is no canopy and a high mesh fence. 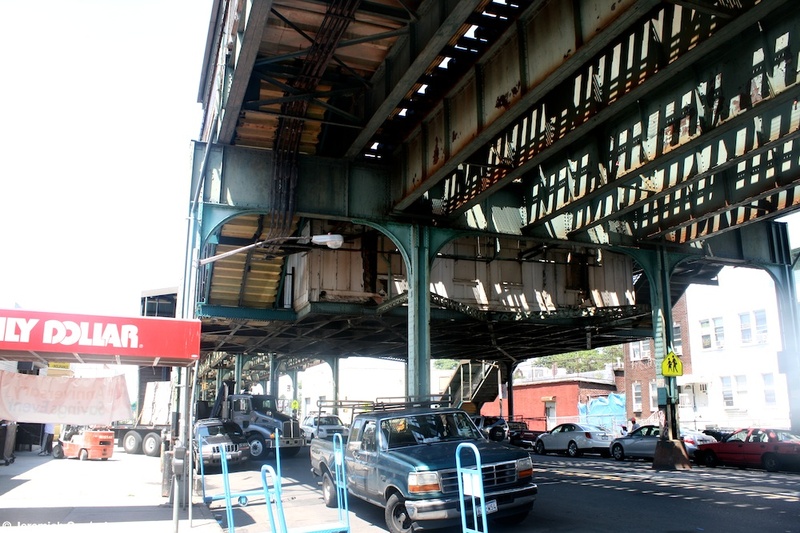 The canopy is held up by small-cantilevered beams. These are all painted green and have little Avenue N signs on them. 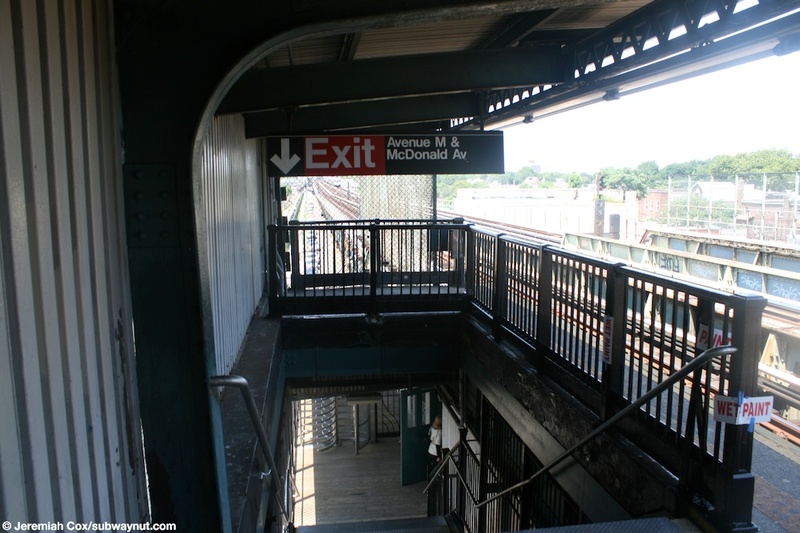 For exits, the station has two. 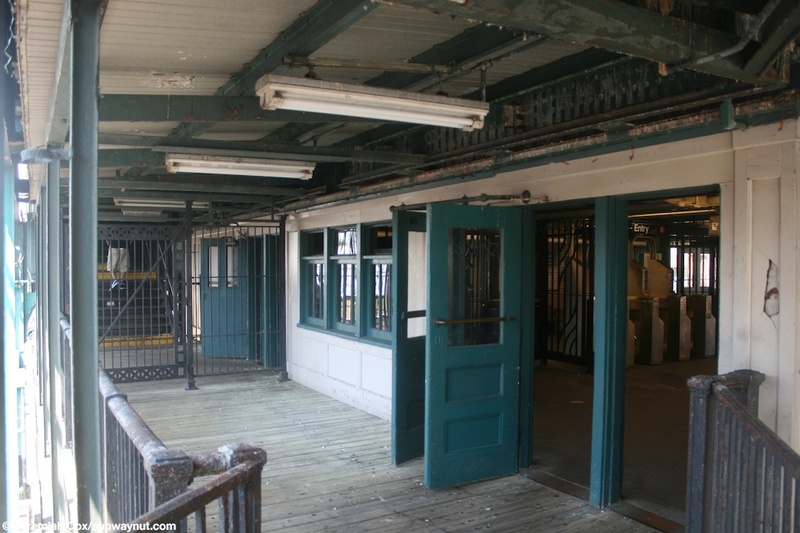 The 24-hour booth exit is at the southern end of the station, a single staircase leads down from each platform to a small station house where the there is the turnstiles and the token booth faces them. 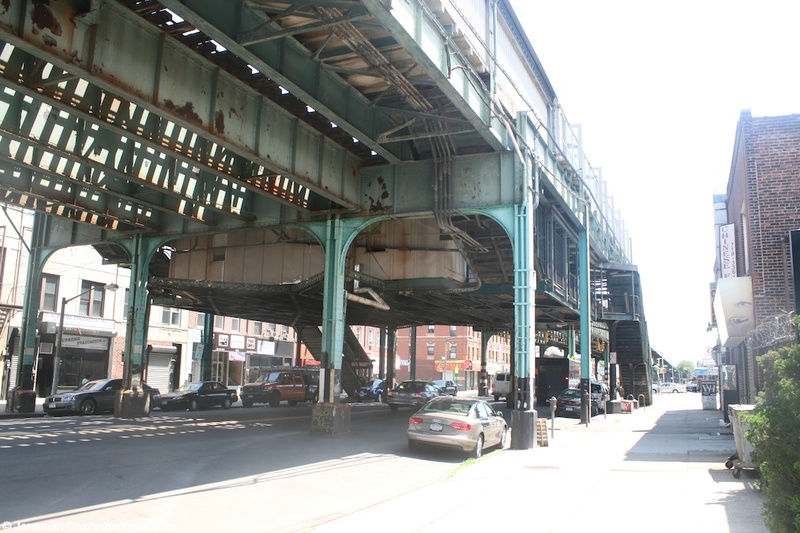 This in turn leads out to two street stairs off the elevated on the northern side of Avenue N and McDonald Avenue. 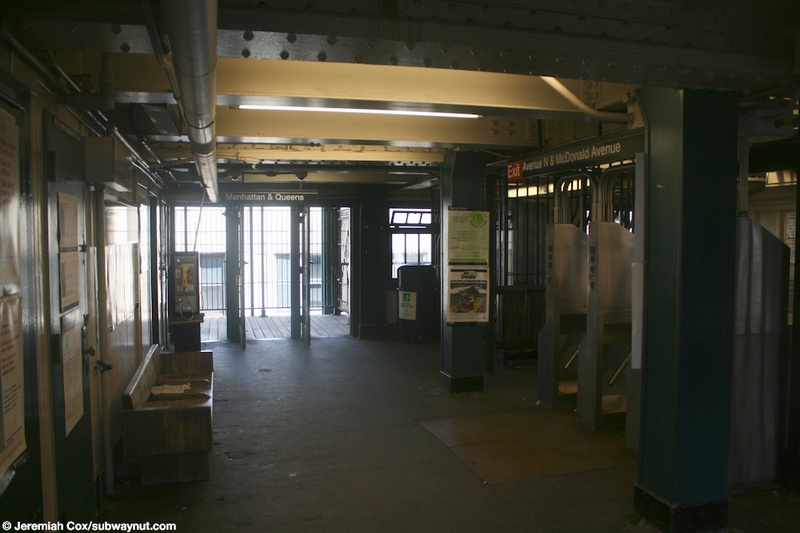 There is a secondary unstaffed exit at the northern end of the station where a single staircase leads down from each platform to another station house that is quite bare, only with High Entrance/Exit Turnstiles, there is a High Exit Turnstile that allows people exiting Coney Island-bound trains not to enter this station house. 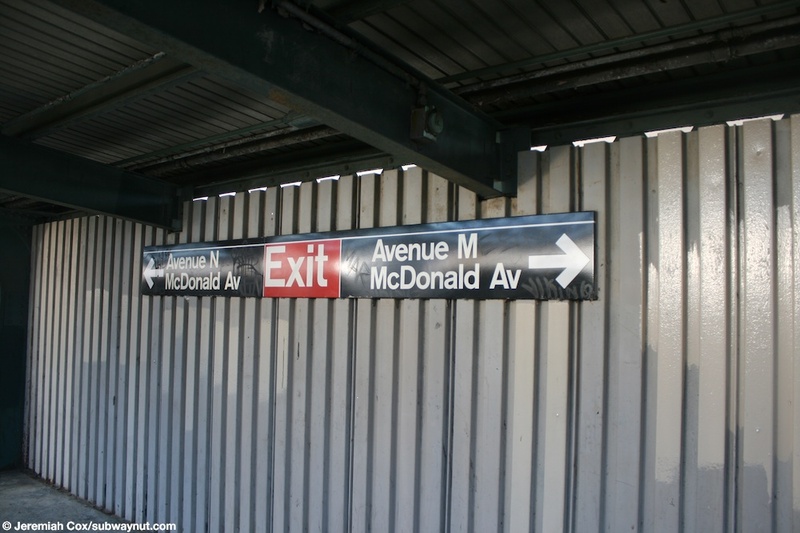 It leads down to two street stairs on eitherside of McDonald Avenue just north of Avenue M.
(ave_nf1) An older sign towards the middle of the platform on the windscreen directing passengers to the two exits at Avenue N or M.
6 July, 2009 (ave_nf2) The exit staircase for Avenue M on the Coney Island-bound platform, the extreme end of the platform here is a chain-linked fenced. 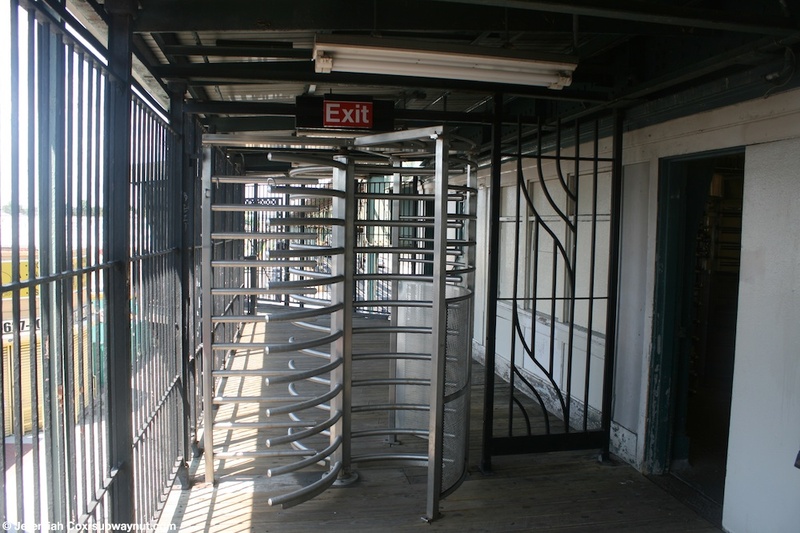 6 July, 2009 (ave_nf3) The High Exit Turnstile that allows exiting passengers from Coney Island-bound trains not to enter the unstaffed station house for Avenue M.
6 July, 2009 (ave_nf4) Inside the station house for the Avenue M exit, there just two High Entrance/Exit Turnstiles and a MVM. 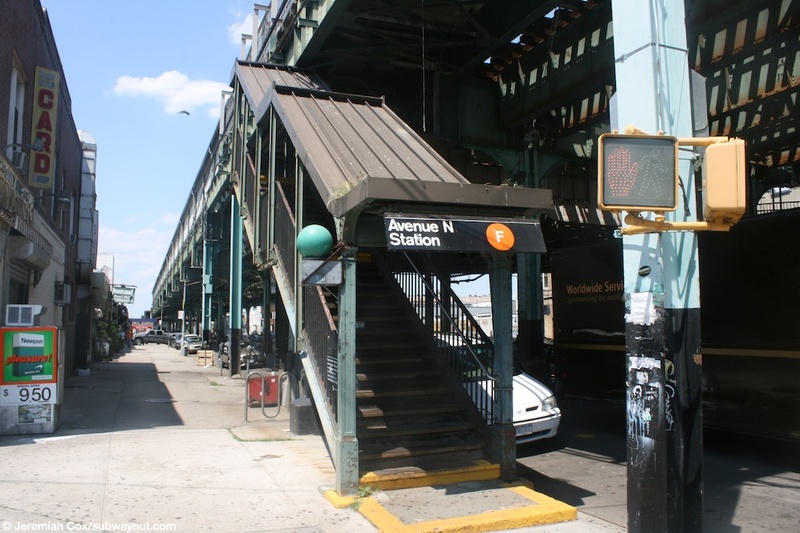 (ave_nf5) A street level, a street stair for the Avenue M end of the Avenue N station, the sign has the unusual notice about how its unstaffed. 6 July, 2009 (ave_nf6) Looking across McDonald Avenue at the other street stair for Avenue M at Avenue N.
6 July, 2009 (ave_nf7) Beneath the elevated tracks, the station house nestled beneath the tracks is visible for the Avenue M exit of Avenue N.
6 July, 2009 (ave_nf8) Approaching the 24-hour booth an entrance to Avenue N, at street level. 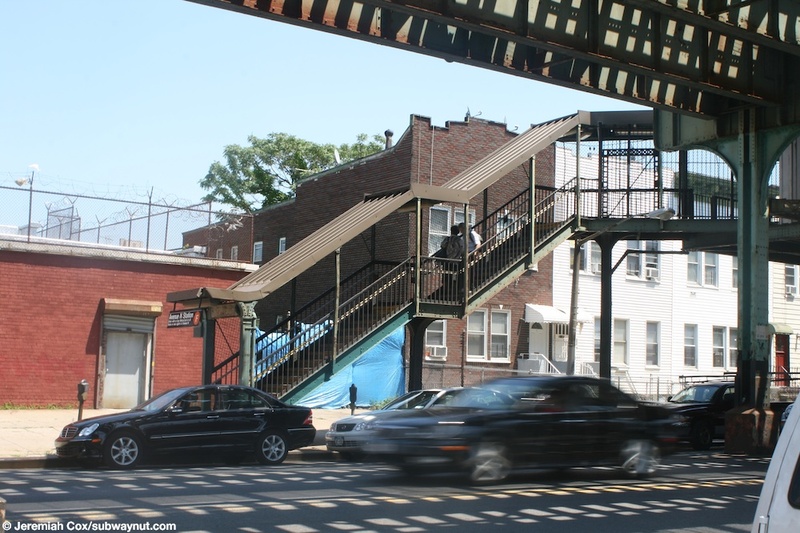 Its a fairly simple subway entrance, a staircase down from each platform, and a pair of staircases down to street level. (ave_nf9) Looking up at the side of the station house at Avenue N, it has boarded up windows and is painted white. 6 July, 2009 (ave_nf10) A street stair for Avenue N, it still has the old font sign on it, notice how much smaller the F is in its bullet compared to the more modern signage. 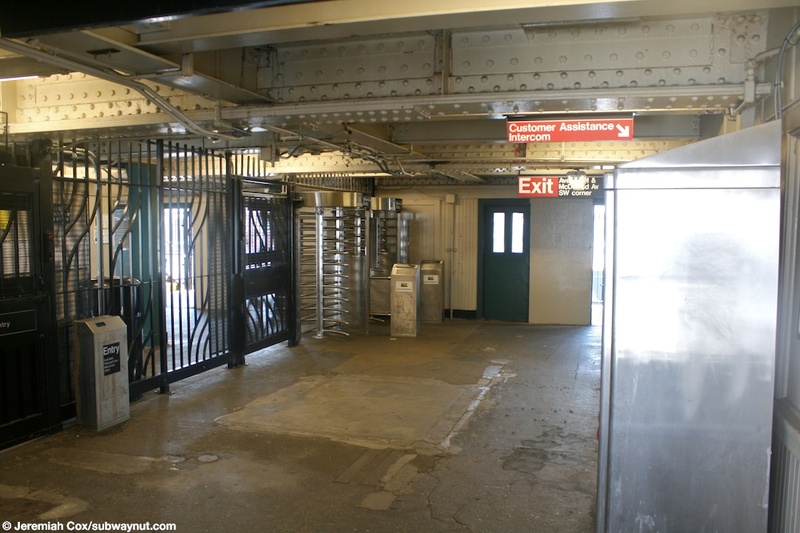 6 July, 2009 (ave_nf11) Approaching a bank of doors into the station house at Avenue N, the doors back out (beyond a fence) to one of the platforms is visible in the background. 6 July, 2009 (ave_nf12) Inside the station house at Avenue N, the bank of turnstiles is visible. 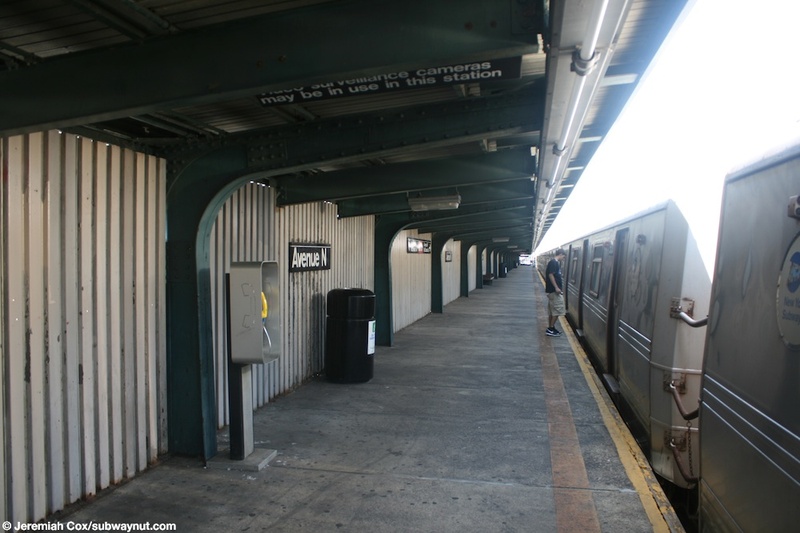 (ave_nf13) On the Coney Island-bound platform at Avenue N, a lone passenger waits to board an incoming train.